No grassy land, or dock. each precious clutch of eggs? I love poetry and I love nonfiction. 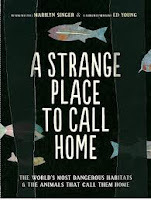 So, when a poet as terrifically talented and erudite as Marilyn Singer combines the two, who can help but be delighted. Your children and students will be intrigued by the fourteen animals celebrated in the work she has written for this collection. They live in some of the most inhospitable places in the world, wrought with danger but also offering safety from their enemies and an abundance of food. They have adapted and thrive there. Some parts of the earth's seabed are slowly moving apart. As they move, cracks form. Seawater seeps into these cracks and is heated by magma -molten rock deep in the earth - to temperatures far above boiling. The water spews back out like a geyser, carrying with it many minerals. When the superheated water reaches the cold ocean water, the minerals clump and form amazing chimney-like shapes. It would seem that few animals could live around these hot vents, but tube worms (Riftia pachyptila) are among the creatures that can." Huh!?! Once she has regaled us with all the tidbits that give knowledge of the animals included, she explains to her readers about the poetry forms that she used. What an encouragement for young writers try out some of the forms on their own. To add to an already exemplary book, Ed Young has created wondrous collages using deep, rich color and textured papers that make you want to reach out and touch them. He cuts and tears his papers to fill each double page spread with much that is of interest in these varying and dangerous environments. We're not sure where Jimmy lives; we do know that he is happy there. His small town lies on a sandy beach near water, and has a church, and a gym with a boxing ring. The gym is a meeting place filled with action. Don Apolinar owns the gym and sees Jimmy as a promising athlete. He sends him out on a run. Everything is coming up Jimmy and he is happy. 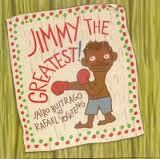 When Don Apolinar has to make a move away from the village in order to better his life, Jimmy is happy for him. He says goodbye and wishes him well. Following his beloved coach's departure, Jimmy works to improve life in his own village. In doing so, he makes an important discovery about himself. The sandy backgrounds are surrounded by blue skies and wide sea expanses. Shacks litter the beach, and much information is included in the detailed illustrations. The rich yellows, browns and tans create a setting that lends warmth to this story of a boy who recognizes that he has something to offer. The people are busy and happy, working with purpose and playing with abandon. There is much that makes Jimmy's home worthy of hard work and leadership. He finds that he is fine with this new role. "The next morning Mr. and Mrs. Bartleby were alarmed to discover that their son had climbed up inside the living-room chimney. They were even more alarmed to discover that Bradley had nailed several sticks of dynamite around the chimney walls. "What are you doing, dear?" 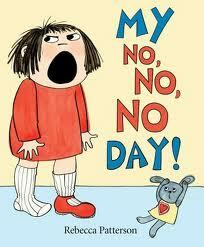 asked Mr. Bartleby nervously." save it for next year. catch the fat fool and take every present he's got." His parents cannot fathom the depths of destruction that their progeny is willing to devise to get his own way. As days go by, the trap becomes more and more elaborate, involving dynamite, stolen tigers, guillotines and trap doors. 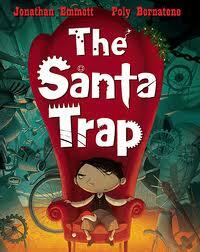 By the time December rolls around, Bradley has the 'Santa Trap' set and is ready for action. The boldly colored artwork will inspire much consideration and discussion. There is a lot to see as Bradley carries out his plan to make the coming Christmas an unpleasant surprise for the man who so selflessly gives to the children of the world. The expressive faces add drama and concern as Bradley moves forward with his plan, always thinking first about his own needs and his revenge. His face is perpetually diabolical as he carries out each well-planned step. He can only imagine how devastating it is going to be for Santa himself. In the darkness we can sense his sinister charm as shadows help to tell the real story. Santa, the object of the year's diabolical plan, does not succumb to anger or omission. He arrives, carries out his benevolent work and leaves just what Bradley is going to need, plus his usual gift. So much fun for those who are not so enamored of the regular fare at this festive time of year. I can't wait to share this book with a classroom full of kids! I have always been interested in alternate tellings of traditional fairy tales; and you know that there are many wonderful tales told. This one just adds to that growing list. The three little pigs are two brothers and a sister...we note on the title page that they are in a zen zone as the story begins. Bedecked in colorful kimonos, they sit with eyes closed, backs straight and determination in their bearing. Taking it upon themselves to rid their town of the wolf's bullying, they decide that the martial arts might be the key. The first brother tries aikido, tires of the drills and drops out. The second brother chooses jujitsu and learns some of the moves but is anxious to try his new skills as quickly as possible. The sister pig chooses karate, and with long hours of constant practice and earnest persistence comes away with her black belt. and I am not bluffing. I warn you, I'm willing to fight." and life was forever wolf-free." It's a rhythmic riot that will have listeners begging for more. We are told that Dan Santat's illustrations are fashioned using Sumi brush work on rice paper, then finished in Photoshop. I know nothing about that but that he is obviously an expert at it. If you have read this blog on any regular basis, you will know how much I admire his artwork. I am always on the lookout for his new books. I love how he has incorporated traditional Japanese settings and patterns to give it authenticity for his audience. Kids really appreciate his graphic style and are sure to be intrigued by the characters created for this retelling of a familiar traditional story. "I'm a part of this story. I marched in Alexandria too. I was excited and hopeful. They had set fire to cars and to a police station." 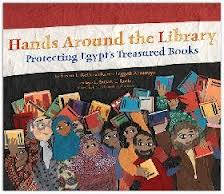 The Alexandria Library has always been a safe haven for many Egyptian people. It is where they learn about freedom, by reading books, by plugging into the Internet, and by talking quietly together. As the young people of Egypt make their wish to have a say known through protest marchesin January 2011, the numbers grow and marches spread from Cairo to Alexandria. even when we were not free outside." "The library has no gates that can be locked,"
"The doors are all glass. except the will of the people." It is the action of one brave young man who takes the director's hand in a show of solidarity to protect the library that inspires others to do the same. Soon, a long line of protectors spread in a circle around the beautiful building. The director is obviously moved and thankful to the protesters for making their point, while refusing to cross the line that keeps the library from wanton destruction at the hands of a mob. There is no excess of text in telling this true story from last year's protests in Egypt. It is told with clarity and brevity. The single act of bravery is the essence of the story. Telling this contemporary story of tumult in a country far away is a reminder to readers that we live while history is being made. I love Susan Roth's collage depictions of the brave and chaotic moments. She uses fabric, textured papers, protest posters, and finishes with real photos and captions of the events that transpire and the incredibly beautiful library itself. Using Shaimaa Saad, former children's librarian, as the narrator gives it a very personal perspective. It is a stirring depiction of a historical event that happened just one year ago. additional description of the graphic leit motifs used on many of the book's pages. "Another possibility occurred to her then, one that struck her as by far the most interesting. Maybe her uncle was exactly like her. Maybe he simply wanted to be left alone. Roo had never understood the strange attraction people had for one another. It baffled her the way people always herded up, endlessly talking, talking. What on earth did they have to say to each other?" Roo loves to be in small, dark places where she can go undetected. We meet her first while hidden under the family trailer, behind the skirting that surrounds it. Luckily, she is unobserved when people come looking for her father and his girlfriend. In a drug deal gone bad, both die. It is an nosy neighbor who suggests the police might find her in her favorite hiding place. Following placement in a foster home, she is sent to live with her father's brother, a rich and odd uncle she has never met. That doesn't change much as her uncle is rarely home and, when he is, he secludes himself. The story is set on a bleak island in the St. Lawrence River, called Cough Rock as it was at one time a sanitarium for children suffering from tuberculosis. It is an interesting, but odd, place that houses her uncle, his assistant Ms. Valentine and another worker named Violet. Roo's room is in the west wing. She is warned that the east wing is off limits. As she explores she finds much more than she has bargained on: closed-up rooms, new sheetrock that covers only one half of the hallways she walks down, humming sounds. She even hears cries in the nights that make her wonder about ghosts. Persistent and drawn by her love of nature, she finds a passageway to an old, seemingly dead garden and decides that she will try to bring it back to life. It will give her something to do, and provide another secret place for her to be. While carrying water to feed the plants, she meets Jack, a boy who makes his life on the river and who is believed by townsfolk to be a faigne. Jack is a great friend to Roo. They enjoy many small adventures together. He helps to calm her loneliness, and is willing to work with her in the garden she has discovered. Together, they begin to make progress in bringing it back to abundance. Meanwhile, she is also surprised to find that she has a cousin named Phillip, a spoiled, lonely, boy who is never seen beyond the walls of his room. He suffers from depression at the loss of his mother, and is prone to screaming and fits of uncontrolled anger. He immediately feels an attachment to Roo and eventually, she takes him to the garden where the three children work together in peaceful companionship. It proves to be a healing place for all concerned, even her Uncle Emmett who finds them there one day. Ellen Potter calls this a 'novel inspired by The Secret Garden'. Having never read that book, I have nothing to compare. I will tell you that I very much enjoyed this story. Ellen Potter creates a stunning setting, full of mystery and gloom. It is with the characters she fashions that the story gains real warmth and delight. Roo is a strong, independent young girl, often alone and content with her own company. She has a special affinity with the natural world, is open to healing through hard work and eventually lets her guard down in terms of the people she meets...Jack, Violet, Phillip and finally, Uncle Emmett. "So, I came up with a clever plan. I would deliver one of my toys to every child in Cincinnati on Christmas Eve. My mom and dad helped me load them onto some sleds I'd tied together. Just as I was about to leave, I found more toys under my bed. So, I stuffed those into my pillowcase, flung it over my shoulder, and I was off!" Gosh! It is a neverending wonder to me that there are so many stories to tell. In a prior post I told you that I loved learning about Anne's early life in Budge Wilson's brilliant Before Green Gables (Viking, 2008) and was charmed when learning about a young Sherlock Holmes in Shane Peacock's The Young Sherlock Holmes Cases 1-Final (Tundra 2009-2012). Admittedly, I have never really wondered about Santa's early life. serendipitously spelled out for his Claus parents in a bowl of alphabet soup soon after his birth. His crib mobile sports a reindeer, a snowman, a Christmas tree and a penguin, and he is fascinated by each one of them. Being the first and only Claus child, there are many photos taken to chronicle each of his life's major events. He is obsessed with toys as a toddler, and carries them with him wherever his little feet take him. He sports a beard in kindergarten, emulating his father and amusing his classmates. His father, a toymaker has a basement workplace where father and son work endlessly...until one day, when the toys appear to have taken over. Not a single space left for the next invention. It calls for action. 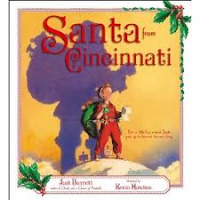 Santa, being a benevolent and generous young man starts in Cincinnati. Successful beyond any dreams he might have had, the event becomes an annual one and moves beyond Cincinnati's border to encompass all of Ohio. The rest of his life is humming along as well.. success in school, a driver's licence, senior prom, college dreams. Oh, and his life's work...what might it be? "I was able to shorten my list of toy recipients by finding out who was naughty and who was nice and making two separate lists. That cut down a bit on the number of toys I needed." The rest, as they say, is the stuff of stories and dreams. His workshop continues to fashion toys that are coveted by children all over the world. While he has gotten older, a bit heftier and perhaps a bit slower, he has a new sleigh...and it does a great job! The voice is so clear and original, you would swear you are hearing it 'right from the horse's mouth'. It makes me want to sit down and do a quick interview regarding some of his most memorable Christmas Eves. Kevin Hawkes adds his formidable talent to the telling using acrylics and colored pencils and offering clues to Santa's life from the front cover to the back. The colors are bright and inviting, the captioned photographs give the audience a chance to see the many times in Santa's life that portend his future calling. What Judi Barrett doesn't include in the text, Kevin Hawkes provides to keep us thinking. His humorous, well-designed artwork adds to the magic and should have every child in Cincinnati checking for this wonderful new book under their Christmas tree...this year, or next, or in years to come. Then, they can tell others, who will tell others...and on it goes! It is destined to be a 'keeper'! And four ducks with trombones!" 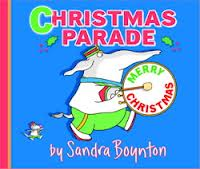 If you can't picture it, you will need to get your hands on this new Christmas book from the adept and always entertaining pen of Sandra Boynton. 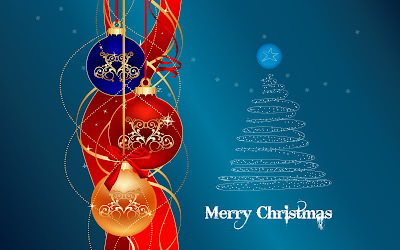 She sure does know what little ones love, and here she shares that knowledge in a rollicking, rhyming parade of her signature characters all wishing readers a very Merry Christmas. The troubled pig at the bottom of the page wonders aloud what the noise is. She's encouraged to run to the window and get ready for a big surprise! First on the scene is the elephant, focused on his task of beating the big bass drum that keeps the beat and leads the band in stately fashion. The chickens are next, one is perplexed. Maybe she doesn't know the music...she appears distracted, that's for certain. Along come the piggies hoisting balloons and a banner. A host of drumming hipppos and a single cat drummer are next. Then reindeer spread 'holly'day cheer with a confetti of holly leaves (ouch! )...they are followed by more musicians and a wee tiny bird foisting the largest tuba you've ever seen! A knock at the door hails the, once again, troubled pig to the door for a final friendly Christmas wish! It's full of fun, with much to discuss. You are sure to hear that phrase that readers love to hear....again, please! "Juno, a beautiful donkey with a white chest and legs, and big brown eyes was one of them. Her abusive owner hit her with a shovel and didn't give her much food. A concerned neighbor purchased the starving donkey and eventually sent her to the DSC. Today, Juno lives with a small group of older donkeys. She's still nervous around people but is getting better all the time." "I also realized that sanctuaries can change human attitudes toward animals. They provide a different, friendlier connection to animals that can change perceptions and beliefs. It's dramatically different from looking at animals caged in a zoo or performing in a circus." He goes on to give a clear picture of what the best sanctuaries are, how they work, and what animals you might find there. 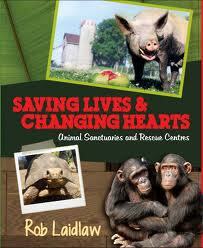 He lists the principles of real refuges, and offers a clear look at what rescued animals need. Then, he moves forward to tell us about some of the best places in the world that he has visited and where he has seen close-up the work these remarkable people do. From donkeys and farmed animals, to elephants, bears and birds, he paints a picture of some of the animals that find shelter in them. The work is varied, and always places the focus directly on the animals needing help. "At the centre, a series of separate open pools with dry haul-out areas allow the animals an opportunity to swim, sun themselves, or just relax in a safe and secure environment while they recuperate. Good food and excellent care ensure that when they are released, they are fit and healthy enough to survive." There are accredited members in North and Central America, and in Europe and Africa. He gives needed advice when considering opening a sanctuary and for those young readers wanting to be an advocate for animals. There is a lot that we can do! In the back matter, he lists many selected sanctuaries and organizations, adds a useful glossary and index and includes testimonials about Saving Lives and Changing Hearts. Positive and positively enlightening, this is a book for the animal lovers in your family, or at your school. "This was different. I'd only seen him cry like this once before. It was about a week after Jesse's funeral. We'd been washing dishes, and he suddenly sank to the floor and started bawling like a baby, for what felt like hours. My mom and I finally left him on the floor and went upstairs to escape the awful sound." It is not a difficult task to love and admire Susin Nielsen's work. This is her third novel and I am a huge fan of each one, and every word written. She is VERY good at what she does. the '60s called. They want their look back! He says, "How does that make you feel?" a lot, like we're on a TV show and not real life. He also says, "Holy Moly" a lot, as in "Holy Moly, you're fifteen minutes late, two weeks in a row!" I loved Henry from the very first page. He has much to share in his journal, reluctantly written. He ise trying to leave behind the nightmare of his brother's pain filled and irrational decision to kill the bully who has mercilessly tormented him and then committing suicide himself. Henry wants no one to know the trauma their family is facing, and he certainly doesn't want to talk about it all in a journal. But, that is his given task. So, he includes entries about being on the Reach for the Top Team, about his growing friendship with Farley who has issues of his own, and his fascination with Alberta, a beautiful, sometimes scary and always refreshing female classmate. 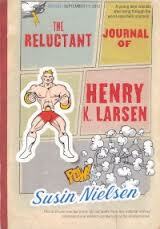 Susin Nielsen is achingly adept at handling the pain and grieving that Henry faces. She writes with honesty and holds nothing back. At the same time, her book is funny, poignant and eye-opening. It is often humor that hides the hurt and allows some relief from the depth of pain being felt. Henry's voice is powerful, resilient and vulnerable. You will not forget him. The other characters created to people Henry's new life are very special. Neighbors who have endured their own pain and are trying to come to terms with the ways in which their lives have changed, new school friends who prove to be loyal and compassionate, even old friends who have found peace through healing. Henry learns much in his new school. Bullies always find their targets, good people are everywhere and pain, regret and guilt can be alleviated with support and time. "We entered the school. I could tell right away from the looks I got that Farley was right. People knew. But I think Farley must have talked to the Reach For The Top kids because, whenever I walked into a classroom, one of them would come and sit beside me right away. Like in Socials, Jerome sits beside me all the time now. He's a man of few words. "Hey," he'll say as he slips into the seat beside me. "Hey," I'll say back." Henry is a charmer. He will make you laugh, and he will make you cry. If you are embarrassed to cry in public or to laugh out loud while your head is buried in a brilliant book, read it when alone. But do read it, please. It is so worth it! "The weeks passed. Every day, we whispered about Maya, laughing at her clothes, her shoes, the strange food she brought for lunch. Some days, Maya held out her hand to show us what she brought to school - a deck of cards, pick up sticks, a small tattered doll." This is both a 'mirror' and a 'window' book. I think those who read it, or hear it, will find themselves thinking about their own actions and the actions of others. When they look in the mirror, they might see themselves and consider how their actions (no matter how small they are) have a ripple effect in their world. When they look out the window, they may be able to see exactly what is happening to a child who is being bullied and begin to understand the heartbreak felt. 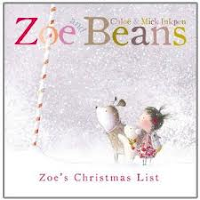 It is Chloe's voice we hear as we read. She is in her classroom when the new girl arrives. Maya is quiet and unwilling to look up and into the eyes of her new classmates. Her clothing is old, her shoes broken. The only place for her to sit is in the desk next to Chloe's. Chloe is resolute in her refusal to look Maya's way or to interact with her. There is no smiling, no invitation offered to play, no acknowledgement that Maya has feelings. Despite Maya's attempts to make friends, the other girls ignore her. Then, one day, Maya's seat is empty. 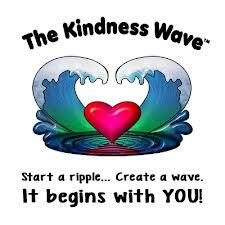 A shrewd teacher determines to teach a gentle lesson about kindness by showing her students how a pebble dropped in water causes ripples to form and to spread out from the center. She asks her students to share an act of kindness. When it's Chloe's turn to drop the pebble and share, she has nothing to say. Chloe's mind fills with the many times she might have been kind to Maya. If only she had a chance to smile back, she would do so. She waits for Maya to return to school so that she can right the wrongs. When the teacher tells the class that Maya has moved on, Chloe must live with what she has done. Girls are very good at this type of bullying...ignore another student and dismiss them as irrelevant or unacceptable. It is a story that needs to be shared to try to help them understand that their actions do have consequences, sometimes for themselves. Chloe will not get the chance to change how she treated Maya; she may think twice the next time someone new comes to the classroom door. This pairing of author and artist is a beautiful thing to see for a second time. The Other Side (Putnam, 2002) has a forever place on my 'keeper' shelf and remains a story that I return to often for sharing. 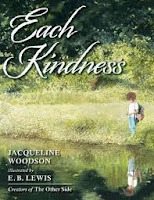 E. B. Lewis fashions a very realistic look at Maya's world as she first arrives and then tries to thrive in a new classroom with new classmates. We are made aware of how isolated she feels every day as she is first ignored, then teased by unfeeling classmates. She is alone at her desk, in the cafeteria, on the playground. When Maya is gone and the pebbles dropped, it is Chloe who is alone, holding the rock she could not drop. 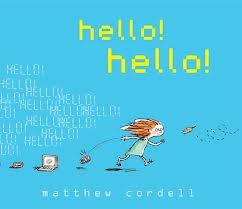 This is one of the few books for young readers that does not end well, and is sure to spark much discussion in capable hands. We know how Chloe feels, but can only imagine the same for Maya. Stepping into an illustration (putting yourself into that person's place) may offer ideas for sharing the feelings being felt. There is so much truth and emotion in the words and pictures. We are blessed to have such truly brilliant artists making picture books that will long live in our collective memory and that are sure to impact our thinking. "Fear finally caught up with me. 'Twas the wail of a banshee. I peered around the stone once more, but I caught no glimpse of the pig boy. Naturally. Perhaps knowing that death is close makes you strong. For, indeed, if death is coming for you, what do you really have to lose by being brave? Things could hardly get worse." This lively story provided a most enjoyable read for seven straight nights! No matter how tired I was, I could not turn out the light until I had completed the next tale. It was absorbing and a distraction from the hoopla that is Christmas. So, each night I anticipated Trinket's next adventure and her sharing it with me (and with you, should you read this wonderful book). 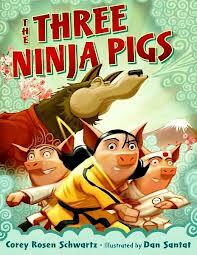 All she has left, once her mother dies, is a less than perfect map and the friendship of Thomas the Pig Boy. Together, they set out to follow the map in search of the tales that will lead to a new and fulfilling life for Trinket. Her father was a noted storyteller, James the Bard. She has no idea what has happened to him. After leaving the family one year to ply his trade, he never returned and it has been years since she last saw him. As they travel Trinket has hopes that she will learn of her father's whereabouts, and discover why he abandoned his family so long ago. Their adventurous trek has Trinket and Thomas meet a gypsy girl named Feather, rescue a child stolen by the selkies, take on a screeching banshee, listen to a ghost's message concerning her mother, help a girl win in a contest with the Faerie Queen, lose everything to a highwayman and get it back with the help of a pooka, and meet a dog whose loyalty knows no bounds. Each of the tales would work as a stand-alone readaloud with family, or in a classroom. 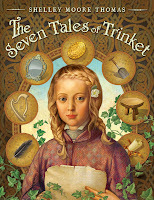 The final tale brings each of the stories to new meaning for Trinket and for her listeners. In the seventh tale, she learns what has happened to her father; it is a life-changing event. 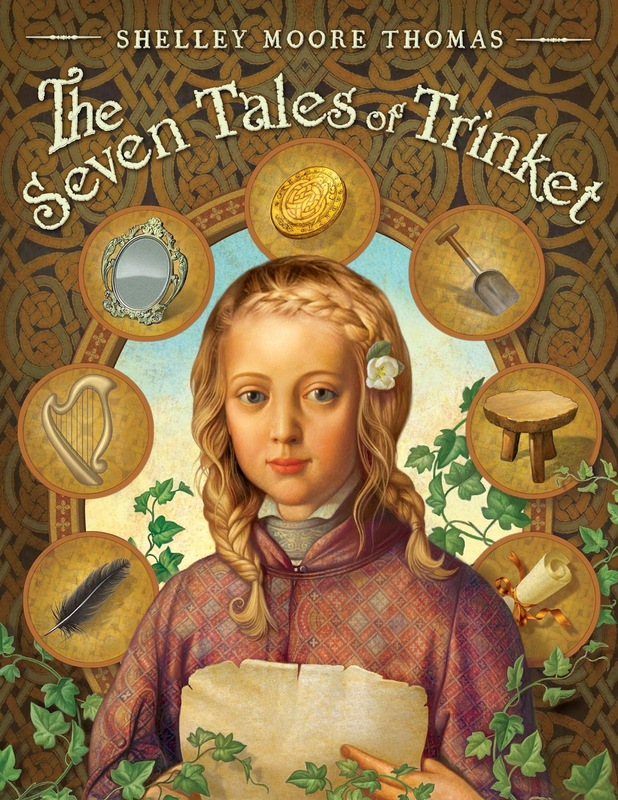 Readers will be captivated by each of Trinket's tales. They are unusual, with good doses of tension as well as much appreciated entertainment. Life is not easy for the two young friends but they find friendship along the way and always manage to keep desperate hunger at bay. Their perseverance and their loyalty to each other pays off in the end, despite some obvious arguments and misunderstandings. Trinket and Thomas are worthy characters and readers will find themselves rooting for their success. Their magical adventures leave us longing for more tales in the future, and to knowing what awaits the young pair as they move forward with their lives. "On the way home we met the lady who lives next door and she said that Bob was the sweetest thing she'd seen all day, and they she said, "And how is Bella?" I was a long way behind so I had to shout, I HAVE A HURTING FOOT! And Mommy said I could keep my voice down and could I PLEASE stop lying on the sidewalk." We've ALL had a day like that! It seems that not one thing goes right, and mostly we just want to screech our frustrations out loud! I am feeling a little like Bella today...overwhelmed! For a little girl, with a baby brother and other social expectations, it's just too much! She's in a bad mood, and that's that! It begins with her baby brother Bob bothering her while she is still in bed. Following that, things go from bad to worse in her sense of the world. An egg for breakfast has no appeal and leads to her being angry enough to refuse to wear shoes. A trip to the market and a ride in the shopping cart lead to a full blown temper tantrum, much to the distress of everyone near the cart. A broken cookie at lunch results in a refusal to play nicely with Sasha and Bob. "Today was a very bad day, Mommy. Sorry." It's all a mother needs to hear, really. With hopes that life will brighten tomorrow, Bella closes her eyes and makes her way to dreamland. Rebecca Patterson's illustrations are perfect for helping little listeners see Bella as she succumbs to the frustrations of her day. We watch it as a scene played right in front of us...seeing the differing reactions of all who come in contact with the relentlessly obstinate little girl, gazing upon the many daily and familiar routines of family, sympathising with the mophead with glaring eyes and an persistently open mouth. There is a lot to see and many of the scenes are sure to inspire discussion. I especially loved searching the faces of those watching the many meltdowns...the smirks, the disdain, the concern, the covered ears, and even the humorous smiles. If you have, or have lived with a toddler, you might find yourself and your family in some of the situations shared. Bad days aren't uncommon; thankfully, they fade into endearing memories of a family's dynamic. Familiar to all and perfect for sharing on 'one of those days', this may just be a story you turn to again and again. "Crows and gulls are similarly adaptable birds, which is why they are about as familiar on most urban streetscapes as a McDonald's or a bus stop. But unlike the starling, sparrow and pigeon, crows and gulls have been in North America for as long as people can remember - probably longer - because both are native to this continent." What kids don't love animals? I know only a few. Once again, I pick up a book by Nicholas Read thinking I will skim through it, get the gist of the information being shared and then tell you about it. I KNOW that it will be fascinating and fun to read. But, oh no! I get caught up in all that he has to share and so, it has taken a bit longer to get it posted than I had planned. It is worth the wait! It took eighteen months to write this book because he, like so many of us, wanted to know more about the wildlife that is making its way into urban areas. He talked with scientists and experts about this rather new phenomenon; wild animals sharing our space in so many places in North America. As we try to understand and react to their presence, the more we know, the better we will deal with it. It is important to understand what is happening, and work to make conditions better for all concerned. To that end, the author shares much of what he learned while trying to inform himself. Who hasn't seen wildlife getting closer to the places we live? Since he couldn't find other books that would help him to understand this changing landscape, he decided to write down what he had learned in this lively and conversational book. You've heard the stories, so you know that it is an issue for many. Read your newspaper, talk to people: there are many incidents of animals attacking people and their pets, showing up in suburban areas...even a bear in downtown Vancouver after a garbage truck ride. "I try to give people the benefit of the doubt, meaning that I try to understand that the reason they feed raccoons is that they like animals. But how often do you need to be told that it's a bad idea? Because it is. It's a really bad idea-for humans and raccoons." We don't want wild animals to be dependent on us, do we? Once dependent, they lose their will to forage on their own, and given the availability of a constant food source, their families grow in response to it and soon we have overpopulation. It's an accident waiting to happen. The author had a lot of prior knowledge concerning wildlife; even he was surprised at the abundance of certain animals in a variety of places. How about your swimming pool in Florida...and alligators? Or crocodiles in the park while you are riding your bike, or walking? Or raccoons crawling through the 'dog's door' while you are sleeping? What mischief might they make while you sleep peacefully unaware? "Perhaps even more important, I'd like people to remember that what little wilderness is left in the world is home, first and foremost, to wild animals. It always drives me crazy to read or hear about people complaining about feeling threatened by animals in the wild and then wanting to do something about it. Well, folks, that's why they call it the wilderness. It's not a theme park where everything behaves according to Disney. It's the wilderness." If you don't want these wild animals to move into your territory as we have moved into theirs, take responsibility for your actions. In the final chapter of this most readable book, the author offers ideas about what we can do to live with them in our neighborhoods. 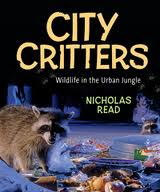 A glossary, a list of resources and an index are each helpful and are followed by an acknowledgement for the many scientists and researchers who study urban wildlife and who answered Nicholas Read's many intuitive questions. There is so much here to read, to contemplate and to enjoy! Take the time you need to pore over the stories, the images, the information boxes and the humor infused into the sharing. "Boot decided to station himself on the front porch and wait there until Shoe found his way back. And Shoe decided to station himself on the back porch and wait there until Boot found his way back. It was a long, lonely afternoon. When it was dinnertime, Boot's stomach rumbled. But he didn't want to eat dinner without Shoe. Shoe's stomach rumbled, too." Here are two terriers you are sure to love...they certainly love each other, despite their differences. They each love the lives they lead, and are happy to spend time together as well. In fact, they share their food dish, a particular tree and their blue bed. What they don't share is the direction they choose to face. Boot finds comfort on the back porch, whole Shoe gravitates to the front one. It's a perfect life. It threw stuff at Boot. It threw stuff at Shoe. Not ones to be pestered by an ornery, bothersome denizen of a nearby tree, Boot and Shoe give chase. They chase that varmint until he tires of the fun, and walks away! When the smoke clears, the two dogs find themselves in unfamiliar territory. In the midst of the mayhem, they have traded porch places. Boot cannot find Shoe where Shoe should be. Alternately, Shoe cannot find Boot where Boot should be. The search is on, with no resulting luck. Both are blue. They guard each other's porch in hopes that the errant resident will find his way home. That waiting is endless. They miss dinner, forego bedtime, wait out a rainstorm and simultaneously stage an around-the-outer-perimeter search for the other. Their luck remains bad. Their night is endless. At daybreak, with no sign of the other's return, they set to sobbing. Luckily, nature calls and both make their way to their favorite tree to relieve themselves where they also make an amazing discovery! P.S. If you are not sure which brother is which...look more carefully! "The dog skips off, a bouncing dot, chasing his tail...a bunny...a blue jay...his tail. Then off he goes to the top of the hill to wait. He is good at waiting. The reader comes slowly, pulling his sled across the world. It is hard work, but he is good at working hard. The wind blows. Snow blows. The hill is very, very tall." 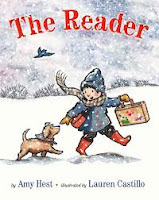 Readers will love the many details that Amy Hest makes evident in her telling of this lovely winter story of great friendship. As the reader and his dog pal set out through the snowy landscape, he is carrying 'a sturdy suitcase that is brown'. We know it must be important as he places it on his 'long red sled with a long, loopy rope'. I can just hear them repeating those lovely details when they read it themselves. "And then he is there, at the top of the world." They have great fun in the snow and take great delight in being with each other. Soon, cold creeps in and it's time for 'warm drinks and crunchy toast for two.' It's a perfect diversion before they get to the real purpose for their trip! "And now," says the reader to the dog. "It's time." There is such invitation in the softness of the ink and watercolor artwork created by Lauren Castillo. She encircles them in the shared love of great friendship, at the beginning and again as their story ends. In between, she creates a soft snow-filled setting meant to entice and invite conversation and memories of similar shared exploits. "My father knows where the good trees are. I walk with him, the basket in one hand, the water gourd slung over my shoulder. We walk a long way. Some of the trees are close together. But most of them are far apart. One tree here. Another tree there. Yet another far beyond. They are not beautiful trees. Their branches are stunted, knotty, spiny." 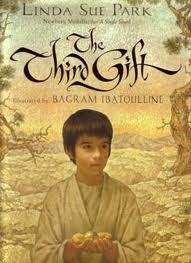 "As for the young narrator himself, I love thinking about the roles of ordinary people in history's great events. History is happening all around us every day, and stories can help remind us that we are as much a part of it as those whose names dominate the headlines." it seems as if the tree is crying." As they travel over long distances and gather the tears that his father then sells to spice merchants, we learn about a very different way of life. There is reverance and pride in the simplicity of it. The father is patient, kind and happy to be teaching his son an old trade. They travel quietly together across a beautifully designed Arabian landscape, doing their work and unsuspecting of the importance it holds for the Christmas story. "I watch the three men mount their camels. I watch them leave the marketplace. I watch as they ride into the desert. And I wonder about the baby." Linda Sue Park also wondered as a child, about myrrh. Since no one asked any questions about it, she assumed that everyone knew what it was...except her. She has since learned that many people had no idea. In her story, she makes it clear that it had many uses. Her use of rich, clear language is a gift to all who share her story. It's hard for me to describe my admiration for Bagram Ibatoulline's artwork. I have mentioned before that books have been described as mirrors or windows. In this case, he creates a window into life as it was lived so long ago. Using acrylic-goucahe he gives texture and depth to his beautifully drawn images of a loving father, his proud and inquisitive son, the desert landscape and the bustle of the marketplace. I just want to them up so that you can ba amazed by each full page spread. This is a book that I will long treasure. A home at night for sleep. Where they'd graze and freely roam. "Follow me!" - and led them home." The question is asked, and Ashley Bryan takes time to provide an answer. “A child built the stable. When Ashley Bryan was riding from place to place while working with children in Africa, he brought out his sketchbook to work while traveling. He noticed an old entry question...who built the stable? It started the creative juices flowing and before they arrived at their destination he had an idea for this loving, warmhearted nativity poem. He is a firm believer that all children want to help when they see that help is needed. 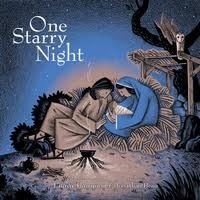 So, his main character is a young boy following in his father's footsteps, who builds the stable where Mary and Joseph will eventually find comfort and shelter. His love for his many animals is evident in every smile, and warm gesture. His dog is always with him. The babe would be a carpenter. He'd be a shepherd too." The full poem is reprinted at the end of the book. You can tell from the cover photo above what a feast for the eyes this new book is. Ashley Bryan uses tempera and acrylic paints in bright and attractive hues to create his artwork. He sets his story in Africa where Mary and Joseph would have traveled and has them look just like any visitor to his father's carpentry shop. Light from the sun, the moon and the stars shine on every brightly colored image, and each will attract much attention as readers and listeners share this truly beautiful book. "Her heart thudded. She'd never lit the wick herself. Too soon after he'd left, a blast of wind blew out the light. Her hands shook. A gust blew out her match. Once. Twice. A third time she lit the match and held it to the wick." 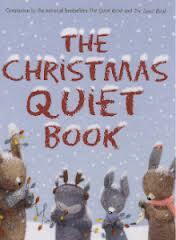 I love to read Christmas tales about families and the situations they face when celebrating together. 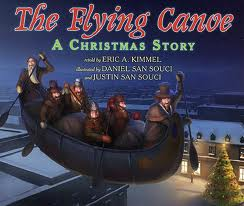 So, I was interested to see a story about a family living in a lighthouse and based on the Flying Santa Service which continues to serve in many areas of the United States today. I had never heard of it, while I have certainly wondered at those who can, and do, live in such isolation. Being city-raised, I cannot imagine the every-day solitude, while I sometimes long for it. As children everywhere, Frances and Peter are full of joy over the coming of Christmas. Since their mother's death, the family has taken up residence at the Ledge Light, an isolated but very necessary lighthouse. There is little left in their cupboards as stormy weather has kept the supply boat away, and Frances worries that Christmas will be very different for them this year...no cookies, or singing and with a wonder about Santa knowing where they are. When Papa offers them a chance to go to the mainland to be with family, they are pleased and decide they will go. Then, when a storm blows up and Papa must rescue a drowning man from an overturned boat, Frances tends the light for the first time. What might have happened had she not been there...how could her father be in two places at one time? It helps her make a decision that changes all of their plans. 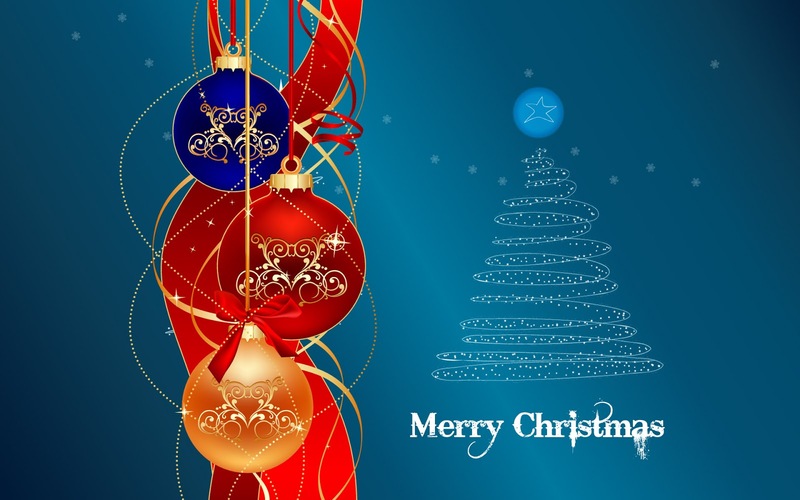 Their Christmas this year may not be the one they were hoping for; but, with a little ingenuity and some help from a very special service, it surely can be memorable. 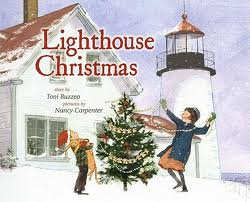 Nancy Carpenter's illustrations make the setting come alive for readers, and also help us see what life was like for lighthouse keepers in an earlier time. The colors are richly hued, the details nostalgic and the characters created with warmth and tenderness for their sadness and their isolation. If you like stories about family, heartfelt sacrifice and making the best of what you have, you are sure to find this tale fulfilling and it may become a Christmas tradition at your house. "This second historical lighthouse book is about the Flying Santa Service, which carried Christmas gifts to isolated lighthouse families along the coast of New England for many years. The story gave me the chance to continue to explore the history of lighthouse living (this time in the 1920’s) and also the spirit of service and giving that imbued those hardy souls who lived on small islands surrounded by sea." It's important to dress up for your holiday party. When you see loved ones you haven't seen in a while, you have to look your best and make a perfect lasting impression! 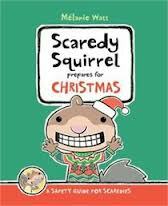 Option A: the classic Christmas-themed sweater look - a popular choice for those who want to blend in with the Christmas scenery..."
Scaredy's sixth book is also his first chapter book...and I know just how he feels. My days are a constantly changing list, and it never seems to help me see the light at the end of the tunnel. I could use his neurotic list making acumen to help me through the next two weeks. Because of its length and the many understandings that readers will have to have about Christmas doings and traditions, this book seems geared for an older audience. I can hear the guffawing in both intermediate and middle years classrooms. It is, once more, a safety guide and there are many warnings attached and discussed. There are eight chapters and a preface...Christmas Is Coming, Christmas Decorations, Holiday Sweets, Christmas Gifts, Christmas Characters, Christmas Pet Peeves, Christmas Fun and my particular favorite because it is so in keeping with Scaredy's persona...If All Else Fails. You can imagine!! There are a multitude of tips that he is willing to share, and please remember that he expects you to take them seriously. There are some red things to avoid when it comes to decorating: dynamite, street signs, chili peppers, dragons, poisonous berries, and fire hydrants. Oh, and green ones, too: Martians, tons of air fresheners, catnip, caterpillars, poison ivy and bullfrogs. There is no end to the advice he is eager to impart. 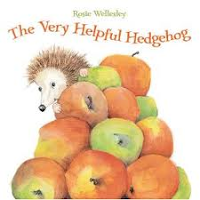 There`s lots to giggle about even for little listeners, but the laughs will come from the older kids who really understand the many references Scaredy makes. 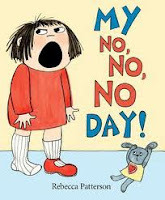 It`s a book about voice, about character, and about making lists as a way to get kids writing. It`s quite unique to tell a whole story using lists, and it makes for a most enjoyable read. Should an Abominable Snowman crash the Christmas celebrations play dead! While doing so, have some fun by making a few graceful moves that will eventually be a snow angel...it just takes some time because you don`t dare let the AS discover your deception! Santa's sick. Who can help? Why, Pete the Cat can...he's first on Santa's list of friends to phone when help is needed. Readers who have met Pete in his other books will know that Pete is a friend extraordinaire and the friend to call on whenever something goes wrong. Should children worry? "Give it your all, give it your all. so give it your all." Once he arrives at the North Pole, he sets straight to work loading the minibus and arranging for the reindeer to give him a tow. Pete never wavers in his belief that he can get the job done. He gives it his all! His work is very much appreciated by everyone at the North Pole where he is lauded as a hero, despite his diminutive size. Pete proves size doesn't matter when help is needed. Bravo, Pete! slushy puddles at her feet. Eileen Spinelli has penned a gentle Christmas Eve poem about ten little mice. They begin their evening huddled together against the cold and snow. With good luck, each little one finds a place of warmth and comfort apart from the crowd. I love the places where they find shelter: a broken branch, a strip of bark, a bird's feather, a clump of moss. They find protection from the elements and with each new home, the number diminishes from ten down to the last one who uses a mushroom cap to cover herself. to be without one's friends this night." Bin Lee's radiant artwork sparkles with moonlight on every page. No matter where we look we can see it bathing the mice, their shelters and the landscape in beauty. It bounces off the ground, the tiny creatures and gives a kind of magic to each turn of the page. The darkness of the night is there in the background, but we never feel its ominous presence. When we finally see the mice in their various shelters, it is evident to all that they are much too distant from each other. They can fix that, and do! What a lovely and uplifting bedtime story for Christmas Eve! "The North Pole was further than it looked. By the time they arrived the wind was sending snowflakes spinning round their ears. It was very tricky sticking something with sticky tape in the middle of a snowstorm wearing mittens. 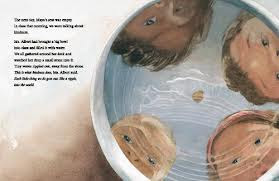 And did you know that when sticky tape gets wet it loses all its stick..."
You may have met Chloe in previous books: Where is Binky Boo?, The Magic Hoop!, and Pants on the Moon. If you have, you know her to be a very feisty and determined child who knows just what she wants in every situation. Do you think it might be different at Christmas? If you do, you don't really know Chloe! They use numerous means of transport. None make the full trip to their destination. Lucky that Beans is her companion, the final leg is his responsibility. 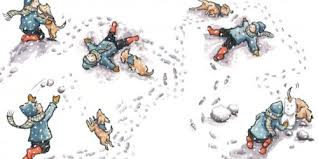 They rescue a lost polar bear cub and once they make landfall, they have a glorious time on the slippery, slidey ice. But, they must plod on. The sticky tape is not strong enough to hold her note to the North Pole with snow falling and the wind blowing. Defeated, they begin the return trek, only to be hampered by a blizzard, crackling ice and fatigue. The morning brings a new problem, and Zoe learns the true meaning of Christmas love and friendship. Children will be charmed by this story of friends on an adventure. The illustrations add to the appeal of a story well told. 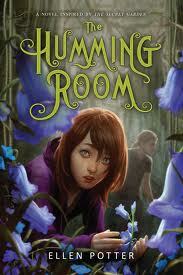 The characters are cute and lively, the setting is magical and the pull out page will them gaping with delight. "The canoe flew on. It passed through a blizzard. Covered in frost, the voyageurs looked like snowmen. Louis peered through a blinding curtain of snow. What was that sound? Etienne listened. It must be the falls of Niagara. They were over Lake Ontario - nearly home! Old Armand brushed snowflakes from his eyes. Home. After so long." It's going to be a Christmas Extravaganza here today as I want to share what's on the pile from this year and last, just in case you still have some gifts to buy. 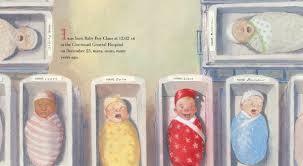 I'll start with a Christmas story from Canada. It's Christmas Eve and six French fur traders are trying to find warmth around their campfire in the woods. They have little food, it's very cold and they are missing their families. They have been hunting for a long time. They share fond memories of their lives in Montreal and all have a fervent wish to be home with their loved ones. Even Pere Noel will not find them in the stark woodsy wilderness. "I have been known to do a good deed from time to time, if only to amuse myself. Hear me, mes amis! I will return you to Montreal this night, on one condition: you may not speak until you reach your own homes." If they fail, he will return them to where they are right now. Nothing to lose, right? Armand is not sure it is a good plan, but his friends want to go. As the magic canoe takes to the air and they watch the landscape pass below them, the men are engulfed in memories of earlier adventures together. Their ride is quick and soon they are on the way up the St. Lawrence River through a moonlit night. Montreal is in sight! In an author's note, Eric Kimmel tells us that this is a variation on an old French folktale, La Chasse-Galerie which was 'commemorated at the opening ceremony for the 2012 Winter Olympics in Vancouver, B.C., as a canoe with fiddler Colin Maier descended from the ceiling." The illustrators have a Montreal connection. Daniel San Souci's father was a French Canadian graphic artist who taught his son to draw. Now, Daniel shares illustrating duties with his son Justin for the first time in a picture book. Together, they do an admirable job of creating a long ago setting on a dark December night. The voyageurs are shown as hearty souls, bundled in leather, bearded and determined to be home for Christmas. Each piece of art is infused with moonlight, and snowshine. The warm glow of the lighted windows in Montreal is just the welcome they need, as their canoe travels closer and closer to their loved ones. Mother animals watch over their young ones as the stars twinkle from a dark and moonlit sky. There is such peace and love emanating from the pages, and a warm glow to the images created in both words and art. As those who share this quiet little book reverently turn its pages, they will feel awash in the gentle loving scenes and bask in the feelings of security and warmth. Ultimately, we reach the stable where Mary and Joseph wrap their beloved child in that same warmth and love shared by the creatures we have met to this point. It is lovely as the animals gather round to help celebrate the baby's birth and the great joy felt by his adoring parents. "The wild animals featured in this book could all be found in the Holy Land at the time of the traditional nativity story. They are the untamed cousins of the domesticated animals named in the text." The theme is love and the mood is quiet celebration. Lauren Thompson makes gentle magic with her words, while Jonathan Bean uses muted, earthy colors shining with moon and star light to evoke the lovely atmospheric feeling created by the repetitive and rhythmic words. Ah, sleep, little baby! "You get all kinds of people coming into a police station. Some are crying, some complaining. But until today I had never seen one come riding in on a broomstick. "I know my sister is a witch. I'm a witch and our mother is a witch. But she is still a person - well, at least, sort of. And she's been missing for over a week, so I want someone to look for her!" 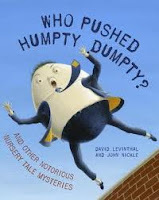 This is David Levinthal's debut picture book, and it is an auspicious start. He creates such an authentic voice for the plain clothes bullfrog detective Officer Binky. The voice comes out of my past, with memorable television characters from The Naked City and Dragnet popping into my head as I read his cases. "There are eight million stories in the forest. This is one of them. It was a typical Sunday morning for the Bear family. They had gone out for a walk while their porridge was cooling." He sets knowledgeable fairy tale fans straight into a familiar story; then regales them with the doings of a wily and persistent detective who is called to duty whenever anything is amiss. Binky is astute and quickly recognizes past run-ins with various suspects, using all of his experience and abundant knowledge to bring each case to a close. The cases offer up hilarity and entertainment. A burglary produces clues in the form of a blond hair, an empty porridge bowl, a piece of blue cloth on a broken chair and a confession. A red CASE CLOSED stamp is superimposed on Goldilocks from behind bars where she is promised three meals a day and lots of rest...it is perfect punishment to fit the crime. Other stories involve Hansel and Gretel, Humpty Dumpty, Snow White and Jack and the Beanstalk. Each investigation results in a closed case, and a lesson learned. They would make great scripts for readers' theatre, with no props needed and use of voice being the way to present each tale. Kids will surely love them, and the performances will assure raves from audience members. They also offer inspiration for students to try their own writing in a new and offbeat way. John Nickle does a commendable job of matching Levinthal's sinister and serious mood with richly detailed acrylic illustrations. My eyes were constantly wandering over each strong image, and back to assure myself that I had missed nothing. They match the film noire tone of the writing, while the cast of characters is just quirky enough to give a reader pause. I can see you forming pictures in your mind...that is the beauty of this book. We can all of us imagine a kind of quiet time. As with the first two books by this talented team, they have ways to get youngsters thinking about their world, and the sounds (or the lack of...) that they encounter in it. Their conditions of quiet conjure up feelings previously felt and specific memorable events. They make quite the team. Deborah Underwood so adroitly puts herself in a young child's head when choosing the beautifully worded scenarios. Her words are an invitation for children to allow their imagination free rein and come up with other such times when 'quiet' is the mood. She moves her readers from peaceful to embarrassed, from sadness to great joy, from entranced to exuberant. Renata Liwska manages to picture each scene with 'quiet' charm and in delightfully soft images. Each one evokes the beauty of the season and the wonder that children feel while immersed in the hustle and bustle of a multitude of activities. 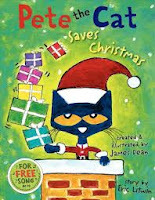 This is their third book; this time the holiday theme allows children who share it a chance to voice their own memories of Christmases past, and revel in the joy felt as the new one approaches. Hopefully, they will be familiar with the format, and eagerly scan each and every page to share the particular type of quiet being described. The engaging animals give a lovely soft feel to the whole. The text is simple, using only a few needed words to incite and entrance. The final image showing two inquisitive bunnies sneaking a peak at the anticipated presents reminds me of just such a scene in our house. No peeking...really???? I love these books for the shared moments they inspire and look forward with anticipation to the next...whatever sound it might be! I have never taken my friends for granted! I know what a real blessing they are in my life each and every day. There are times, I will admit when I am just like Isaac. I think if the truth were known, we all crave quiet at one time or another. Isaac feels like that all the time. He is happy with himself, and likes being on his own. He doesn't need friends. Then, one day an apple falls on him and sticks to his spikes. Isaac uses all his problem solving chops to get unstuck...but, no go! He is so sad. "Hmmm, an apple. At last an apple has rolled into my paddock. This is a story that will hold great appeal for the preschool crowd. They will very much enjoy the predicament that Isaac finds himself in, as well as the very talkative donkey whose love for apples is apparently boundless. And man, that guy can talk! Isaac says nothing! Doesn't even faze the big guy. He's on a roll and he just keeps going...like the EverReady Bunny! Isaac has none of the social amenities that come with friendship. So, he just walks away. He likes being on his own. But, when the next apple falls, he has a change of heart! invitation to venture inside and get to know this tiny, delightful creature. Sure to be a huge success in reading circles and at bedtime, too. Before even laying our eyes on the title page, we have a small inkling for the message this book is about to impart...and an important wake-up call it is! As the tiny redheaded girl makes her way from bedroom to den, we watch her toss her game console, her laptop and her cell phone...and then she checks out the TV, to find it's showing a rerun. Turn the page and there she stands surrounded by a plethora of unsatisfying technology. Only now is our attention given to the title page, consisting of a whole lot of white space, and the two hellos. It offers an open invitation to come in and see what happens! As she wanders the house in search of company, she finds her mother at her laptop, her father texting, her brother playing games on a tablet. None pays any attention to her greeting. From afar, she notices a floating leaf at the front door and is inquisitive enough to follow it outside...where there is much to discover. Matthew Cordell's ability to tell his story through his use of 'a bamboo pen and India ink, a bit of pencil, a Macintosh computer, a large format waterproof inkjet printer, and watercolor on paper' is testament to his formidable talent and his love of story. Hello is the message, and few other words are needed as he focuses always on the heroine. As she moves to the outdoors, bright color and the senses take her further and further from home. Her imagination runs wild, and she escapes the humdrum for the wild beauty of nature run amok. She talks to bugs, smells flowers, and revels in the wonder she finds there. When the horse she says hello to talks back, we know we are in for a ride. Off they go and are joined by flying fish and whales, apes, chickens, mice and giraffes. Their run comes to an abrupt halt with the interruptive ringing of her cell phone. Where is she? The family has noticed her absence. Her parents are frantic. She is contrite. She quickly returns to the grey, drab interior of her home, bringing natural gifts to each family member. As she presents these gifts, she gingerly takes and closes down the technology...color returns! Off they go together to discover what lies just beyond their front door. "I was being that guy who was glued to the device. At home one day, I was playing with my daughter, Romy, who was around 2 years old at that time—too young to know if I was giving her my complete attention. Or so I thought… In the middle of playing with some toys, I thought I would be fine sneaking over to a nearby laptop computer to check my email (or worse… my Facebook page). After a minute or two of having my face stuck to the screen, I heard Romy say from across the room, “Dada, stop checking email and come play.” She was a very verbal young toddler, and I knew she was putting together sentences, but I had no idea she knew the word “email.” I felt bad, in a way, that, already, she even knew that word, but worse that I was not giving her what she wanted because I chose to be selfish at that moment. Whatever I was doing, work or not, it could’ve waited until later when my wife was going to be taking over toddler duty. Later on, it occurred to me that with the amount of technology we are exposed to these days, this whole scenario must be playing out with parents and kids everywhere and all the time. The movable laptop at home is certainly distraction enough. But it is worse with the omnipresent smart phone that follows you everywhere you go, always beckoning to be looked at. At this point, in our culture, you cannot go anywhere without seeing someone in the company of another who is attending more to a device than to the person sitting at his or her side."